These machines became popular in the mid 1800's and were in a constant state of improvement with many patents issued in the 1870's. 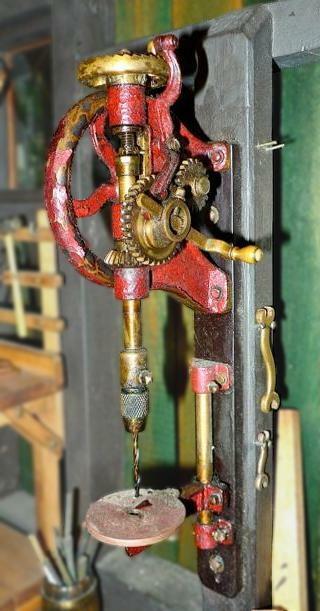 They replaced primitive wood framed machines that had been in use for hundreds of years that were fitted with a brace type drill and tapered square socket. The gearing speeds up the spindle rotation to take advantage of the new twist drills. The automatic feed assures a high pressure at the cutter to insure efficient cutting and free the user to hold the work. Most of these machines had a 1/2" diameter bore and accepted 1/2" shank "blacksmiths drill bits". Some later machines had the option of a Morse taper. All the major manufacturers made these machines (Buffalo, Champion, Canedy-Otto) and there were also small makers as well as private branded machines such as the Acme sold by Sears and Roebuck. 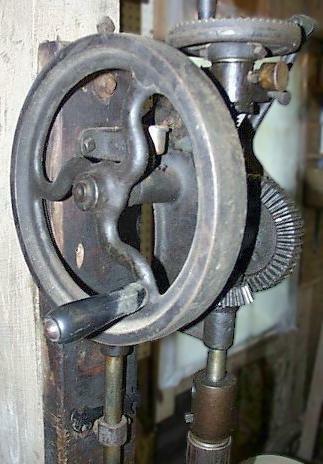 RIGHT ABOVE: Miniature hand crank drill press from the Kremer Miniature Blacksmith Shop, approximately 6" (~152 mm) tall. This drill press is mounted on the oversized mounting board that came with the red Champion drill press above. The mounting boards allow lying the machine on its back without resting on the flywheel. However, this is not sufficient clearance for the hand crank to be used. To mount one of these for use it must be on a very thick board or free standing column. 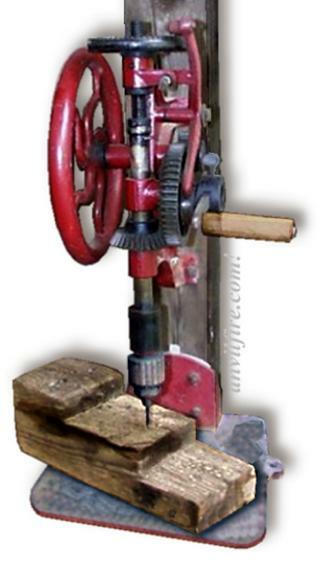 The squared off flywheel indicates this drill press is of later manufacture than the one at top. The flat flywheel can be used to power the machine with a small electric motor. The column on this drill press has been extended 5" and a middle support added to compensate for the addition of the Jacobs drill chuck. Other modifications to this machine include refitting a modern thrust bearing and adding grease cups in several locations. The frame has also been brazed back together where there was a severe break. While it looks similar to the Champions above the feed mechanism operates on the bottom of the feed wheel and requires a spring. I much prefer the gravity operated top ratchet. It is also much larger heavier machine than those above. 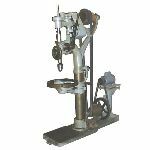 Two Acme hand crank drill presses sold by Sears in the early 1900's. The one on the left is a very large machine designed to be powered by line shafting. Its table is heavy enough that it has a screw and hand crank mechanism to raise and lower the table like large floor model industrial presses. On the industrial model, the loose pulley turned freely and was where you slid the flat belt to disengage the drill. The tight pulley did the driving from a line shaft driven belt. This made for an extra long shaft (about 6 to 8 inches). These are heavy cludgy machines and are not nearly as efficient as later floor model machines. The small Acme to the right is similar in size to the others above. Note the feed paw on the far side requiring a different handed feed screw than the Champions and Buffalos. Compare the prices on the Acme machines above. The bigger industrial model sells for roughly 10¢ a pound while the smaller standard blacksmiths drill sells for 6¢ a pound (weight 120lbs). At the end of the century machinery typically cost $4.00 to $6.00 a pound (about 100 x). The Other Side. . . The hand crank handle on the flywheel is a feature that you do not see on the larger drill presses. This is handy for very delicate drilling at low speed. Drilling a worm gear and shaft for dowel pin. Although I stress modernizing the blacksmith shop there is nothing wrong with the old machines if you cannot afford a drill press. I put NEW Jacobs chucks on both my drills and they became instantly useful machines. These old drills have the perfect features for drilling steel. High feed pressure and low RPM. This results in long cutter life. 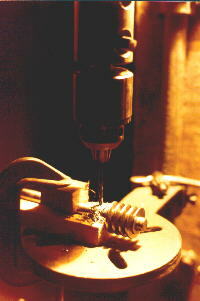 Most electric hand drills turn too fast for drilling anything but the smallest holes. Commonly available department store brand drill presses turn too fast for anything over a 1/2" (13mm) drill in soft steel. 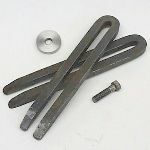 For stainless, annealed spring and tool steel these should be limited to 1/4" (7mm). I've drilled holes up to 3/4" (20mm) in steel with a hand crank Champion drill press. To use one of these machines you place the work on the table, then hand feed the bit against the work where you have center punched. Then you preload the feed against the work until the frame springs a little. Then you engage the feed paw and start cranking while holding on to the work. In some case you may hand feed the drill but this requires clamping the work in place. Holes up to 1/2" are reasonably easy to drill but over that size you really start to learn about horespower and appreciate what a little 1/4 HP motor can do! The worm gear being drilled above is for a 4x6 bandsaw. The replacement gear was drilled on center and the old one not. So a new hole was drilled in the shaft to fit the new gear. Wooden V-blocks are being used to support the cylindrical parts. B&W Acme images, pages 32, 70. 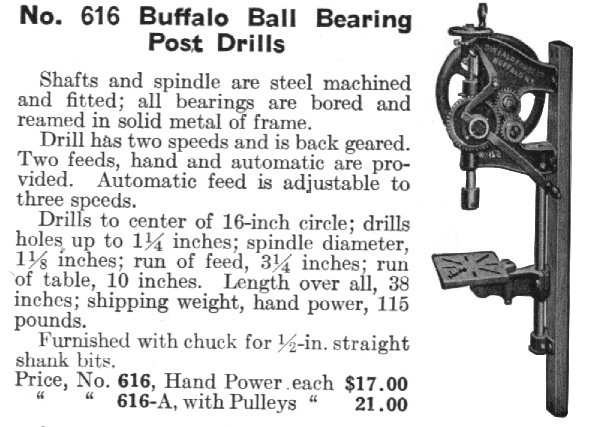 Reprint of the 1915 Sears, Roebuck and Co., Tools Machinery Blacksmiths' Supplies catalog. Originally reprinted by the Mid-West Tool Collectors Association in 1984 and ABANA in 1985.
iForge drill press furniture demo. iForge drill press tooling and accessories demo.